YUKEN hydraulic pump is the power component of hydraulic system. Its function is to convert the mechanical energy of the prime mover into the pressure energy of the liquid. It refers to the oil pump in the hydraulic system, which provides power to the whole hydraulic system. The structure of the hydraulic pump usually has gear pumps, vane pumps and plunger pumps. Compared with radial piston pump, YUKEN plunger pump has higher discharge pressure. It can generally work in the range of 20 to 50 MPa, and has high efficiency. It has small radial dimension, compact structure, small volume and light weight. But the structure is more complicated than the radial piston pump, and the processing requirements are high and the price is more expensive. 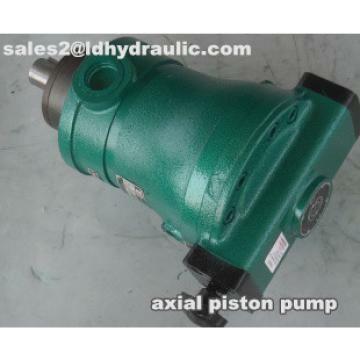 Axial plunger pumps are generally used in hydraulic transmission systems of machine tools, metallurgy, forging, mining and lifting machinery, especially in high-power hydraulic transmission systems. 3. Installation form, F: flange installation L: foot seat installation. Rotation direction, R: clockwise L: counterclockwise. Control mode, 01: pressure compensation control type. 1. Variable Plunger Pump A Series Hydraulic Oil: Oil-based Hydraulic Oil. Anti-wear Hydraulic Oil or R or O (Anti-rust and Anti-oxidation) Hydraulic Oil (ISOVG2 or 46) can be used. When the temperature is 0-60 C, the viscosity range of oil is 20-400 cSt. 2. Variable piston pump A series pollution control: We must pay attention to oil pollution control, otherwise it will damage components and shorten the life of components. In order to maintain the contamination level within NAS 10, the oil suction port must be installed with at least 100 u m (150 mesh) oil filter return circuit, and a filter under 10 u m must be installed. 3. Installation of Variable Piston Pump Series A: The position of the filling port should be upward, and rubber shock pad should be added as far as possible in the installation (customers buy it by themselves). 4. Variable piston pump A series axis alignment: as far as possible use flexible coupling, in order to avoid any stress caused by bending or thrust. The error of different axes should be less than 0.25mm (0.01in), and the angle error is less than 0.2 degrees. 5. Variable Piston Pump Series A Inhalation Pressure: Allow the Inhalation Pressure to be between -0.16-+0.5 bar. The diameter of the Inhalation Port Pipe is the same as that of all the prescribed pipe flanges. The Inhalation Port of Variable Piston Pump is higher than the level of the tank, and the height must be less than 1 m.
6. Variable piston pump A series piping instructions: connected to variable piston pump on the tubing, should be all hoses. 7. Variable Piston Pump A Series Inhalation Pipe: If the Variable Piston Pump is installed above the liquid level, the Inhalation Pipe and the Inhalation Pipe Oil Filter should be lower than the installation position of the Variable Piston Pump in order to prevent air from entering the Inhalation Pipe. Because the hydraulic oil in the suction pipe of the variable piston pump starts to run when the flow rate is 0, it is easy to produce negative pressure. The suction pipe should adopt the size of Table 1 and be shortened as far as possible. 8. Variable Plunger Pump Series A Drainage Pipe: When installing, the pressure in the chamber of variable Plunger Pump should be kept below the normal pressure of 1bar (1kgf/cm2) and the impact pressure should be less than 5bar. The pipe length should be less than 1m, the pipe end should be immersed in the oil, and the oil drain pipe can be individually taken back to the tank. 10. Variable plunger pump A series start: before the first start, clean working oil will be filled with variable plunger pump chamber through the filling port. In order to avoid the phenomenon of air blockage during the first start-up, the regulating control valve can directly return the oil output from the variable piston pump to the tank, or make the actuator move under no-load condition 11. The noise and vibration of the hydraulic system of the variable piston pump A series are controlled by the fluctuating waveform which is different from that of the vane pump, so the noise is affected by the rigidity, installation and piping of the main engine. Noise causes noise to increase, so installation of variable piston pumps requires attention.